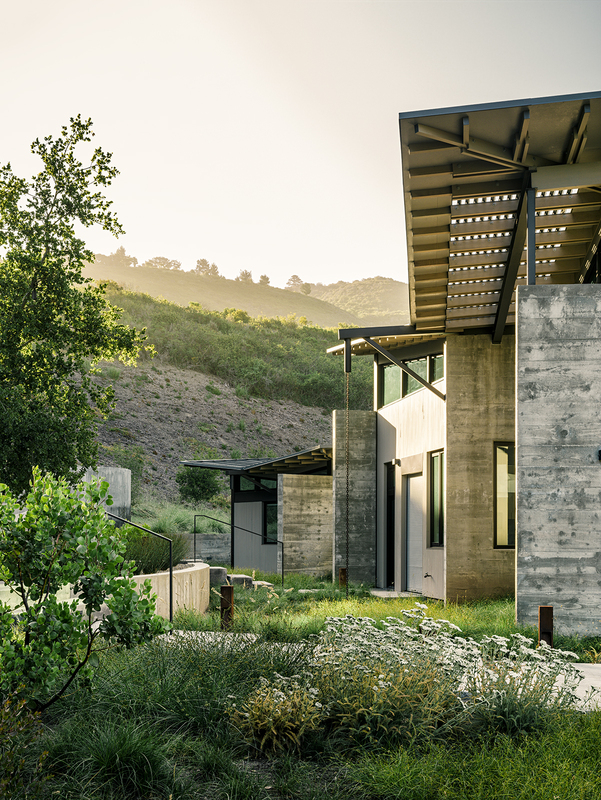 A couple’s retirement home on a nature preserve in Carmel, California, emerges as a series of eco-conscious pavilions that rest lightly on the land. "Pulling the buildings apart allows what is not a big house to feel really big," says architect Jonathan Feldman of the sustainable retirement home he built for a couple in California. "Because of the ways it opens up, it feels much more expansive than it really is." Butterfly House, designed by Feldman Architecture for David and Suzanne Rinaldo in California’s Monterey County, is made up of three discrete structures separated by walkways. The distinct folds in the roofs are utilized for rainwater catchment. Set on five acres, the three pavilions total 2,900 square feet. They gently fan out in a semicircle “like the charms on a necklace,” Suzanne says. The pair recruited landscape designer Bernard Trainor to help integrate the house with the land. Trainor planted native grasses and yarrow as a visual buffer between the house and the natural site. Feldman chose Douglas fir beams as the board forms for the site-poured concrete walls. 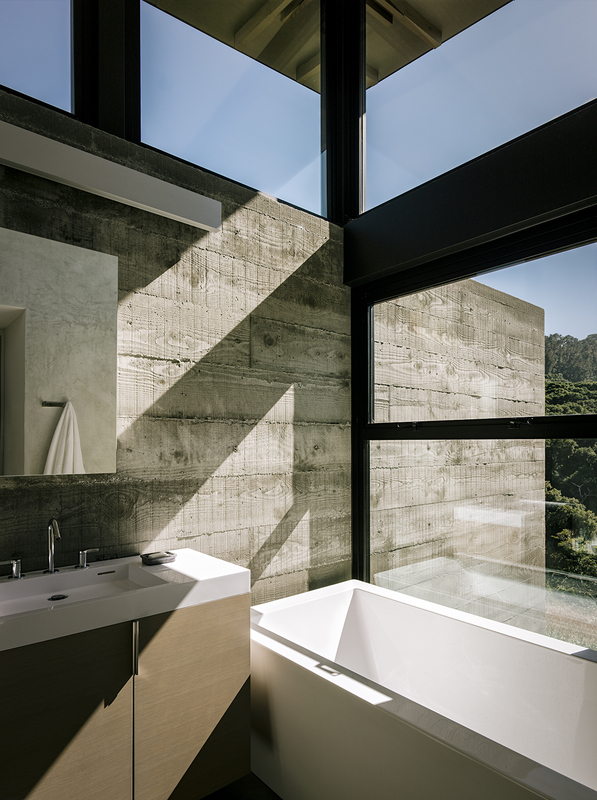 “The rough texture of the concrete helps tie the house to this dynamic and wild setting,” he says. The entrance to the main pavilion is defined by a pivoting glass door from Fleetwood (above left). The stairs lead to the media loft, where Inga Sempé’s Ruché sofa for Ligne Roset breaks up the gray. Among the couple’s few directives were tall ceilings, which Feldman covered in low-cost plywood sheets. In the open living-dining area, a sofa by Antonio Citterio joins a Metropolitan chair and ottoman, all from B&B Italia. A Big Bang fixture from Foscarini hangs above the dining room table, designed by Feldman and surrounded by chairs from Ligne Roset. The bathroom in the guest pavilion takes advantage of the passive solar siting. “Detaching the roof from the walls allowed us to bring in light from the top,” notes the architect. The custom vanity holds a Lacava sink; the tub is AquaStone from Aquatica. More native grasses set the tone near the generously sized concrete pavers leading to the entrance. “We didn’t want the planting to feel like a country cottage garden—that would have felt disconnected with the view behind it,” Trainor says. The bedroom pavilion is mostly hidden, thanks to a massive native California oak—part of a grove. “That’s the good thing about oaks—they keep their leaves in the winter, so you don’t have one view in the summer and another in the winter,” Suzanne says. When David and Suzanne Rinaldo showed architect Jonathan Feldman the site for their new home in fall 2009, they told him they wanted a house with a certain lightness to it, like “a butterfly landing in a meadow.” It’s an apt image for the couple; they run a business out of their home, as management consultants in behavioral health, and flit around the country for their work. They wanted a weekend retreat close to their San Francisco base where they could ease into retirement. Busy as they are, the Rinaldos are also meticulous—it took them two years to find the right piece of land: Once they’d settled on Monterey County, they fell in love with the Santa Lucia Preserve, a 20,000-acre private development and land trust about 15 minutes from Carmel. They looked at close to 30 sites, searching for something flat enough to fit a house on one level, with an unobstructed view. “As we grew older, we didn’t want to worry about steps,” David explains. Next, they looked for a modern architect. “We didn’t want a rustic lodge that looked like it belonged in a national park,” Suzanne says. Since most of the preserve’s homes are Craftsman or Spanish colonial, the couple also wanted someone who could get a minimalist, industrial look past the design review board. 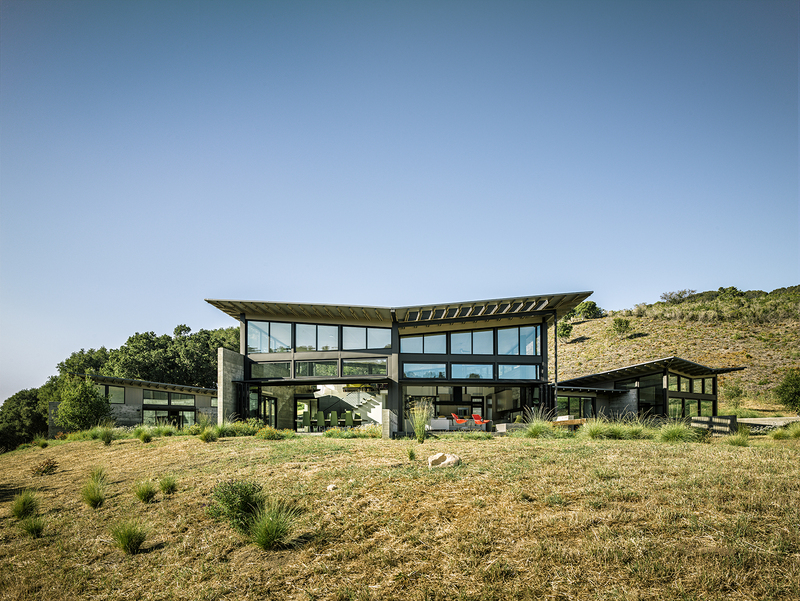 Feldman, who is based in San Francisco, designed his own parents’ house in the preserve. The Rinaldos and the architect met—and hit it off. Knowing the couple wanted to integrate the home with the rural setting, Feldman urged them to hire a landscape designer and suggested a few names. They chose Bernard Trainor for his similarly restrained approach. Grading began in May 2011. Feldman knew construction would be “tricky.” He explains, “There’s no trim, everything’s exposed, yet it’s all supposed to be light, perfect, and precise—on a tight budget.” Luckily, contractor Brian Groza proved to be even more painstaking than the Rinaldos. “Brian does the most meticulous planning I’ve ever seen,” Suzanne says. “[In our work] we do project plans for our clients, but this was far beyond anything I’ve ever done.” The house was finished in 17 months; the roof and windows were complete by March 2012, and the landscaping was in place by December of the same year. By January 2013, the Rinaldos had decided to move to the house full-time. Now they use their San Francisco condominium as the weekend retreat. “I have never been happier living somewhere,” Suzanne says. Feldman chose butterfly roofs for their aesthetic value, not their ability to harvest rainwater. However, “the second we drew it, we were excited about the water-harvesting potential,” the architect recalls. “It fit so well with the poetry of the form—three scoops grabbing the water.” He and landscape designer Bernard Trainor oriented each pavilion to let water flow around and into the surrounding meadow. The Japanese rain chains that they hung at the notches of each roof form captivating flowing sculptures when it rains. Below each chain, they installed a hidden pump to carry excess water into three concrete cisterns that hold a total of 33,000 gallons, or “just about the average rainfall, based on the square footage of the roof,” says David. During the summer, the cisterns passively release water into the meadow to irrigate the plants. Though the tanks are half-submerged in the earth, at first Suzanne worried they’d be eye- sores. “I thought I’d really hate them, but I don’t mind them,” she says. 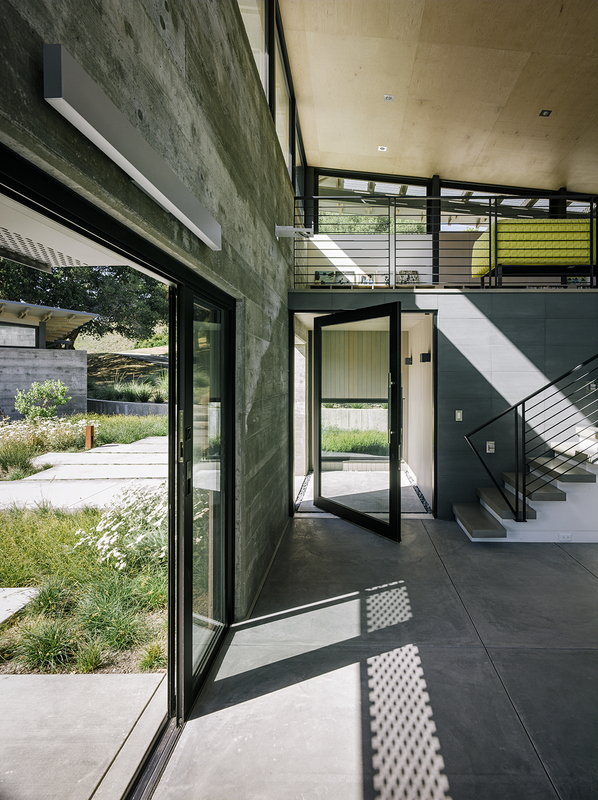 The house’s ten-inch-thick, board-formed concrete walls, along with the concrete floors, act as heat sinks to warm the house on chilly nights, aided by radiant floor heating and gas stoves in the living room and guest pavilion. Accordion-like doors from NanaWall span the living and dining rooms and, during the hotter summer months, open the house to coastal breezes. The butterfly roof allows for extra ventilation: Feldman worked with structural engineer Mike Hicks of Fulcrum Structural Engineering to make the roof appear as though it floats above the concrete walls. The upper windows add an extra layer of ventilation. Hicks embedded slender, stiff posts into the concrete and disguised them as window mulling pieces. Feldman acknowledges that “there are a lot of questions when you have this much glass: Will it overheat or feel cold? Is there too much glare? Is it too bright?” Using computer software to track the passage of the sun through the day and the seasons, he oriented the largest glass walls to the south, to ensure added warmth in winter. Every roof has a wide overhang to shade the panels from glare in summer. Once the Rinaldos were sold on the water system, solar came next. The team found a hidden, south-facing spot, above the garage, where they installed a 7 kWh solar array. The panels now harvest enough electricity to meet half of the house’s electrical needs, which—with all the natural light and passive climate control—aren’t much. “Most of the electricity use goes for the hot tub at this point,” David says.